Boss Fabric Guest Chair with Armrests [B9521] Free Shipping! This guest chair has all the same quality and features as our leather model B9529 except this chair comes in your choice of 4 commercial grade fabric colors. Features include a polished tubular 16 gauge steel frame with black scratch resistant finish and thick contoured cushions for added comfort and support. Moves smoothly over hard surfaces and plush carpeting. Curved arms easily clear front edges when pulled close to tables. Contoured seat and back provides firm lumbar support. Dimensions: Back: 19"W x 13"H x 2.5"Thick. Seat: 20"W x 21"D x 3"Thick. Seat Height: 18" High. 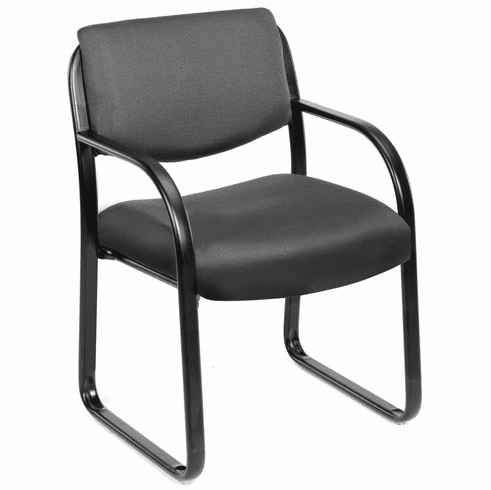 This Boss guest chair normally ships within 2-3 business days from our GA or CA warehouse.